Dual Sided Rewards are Here! Here at SalesCamp we’re all about designing a platform to let you create the referral and affiliate programs that your business needs, easily and seamlessly. This means a lot of things when it comes to our platform…things like our Stripe integration, referrer transparency via Referrer Dashboards, and multiple ways to trigger rewards in your campaigns. And today we’re excited to announce another addition to your referral campaign arsenal: Dual Sided Rewards. SalesCamp has always had in place Single Sided Rewards, where only the Referrer is awarded something for sending a new lead or customer to your business. But now you can create Dual Sided Rewards within your SalesCamp account. So while an external affiliate might want to be paid in cold, hard cash, that might not be the best fit for your new customer who also is to be rewarded. For them, it might be a free month of your service or unlocking a new feature or even something like a discount off of their monthly bill. Both the Referrer (person sending new leads and customers your way) wins because they get rewarded, and the new lead/customer gets rewarded too because they came into your business via a referral campaign from a highly trusted source. 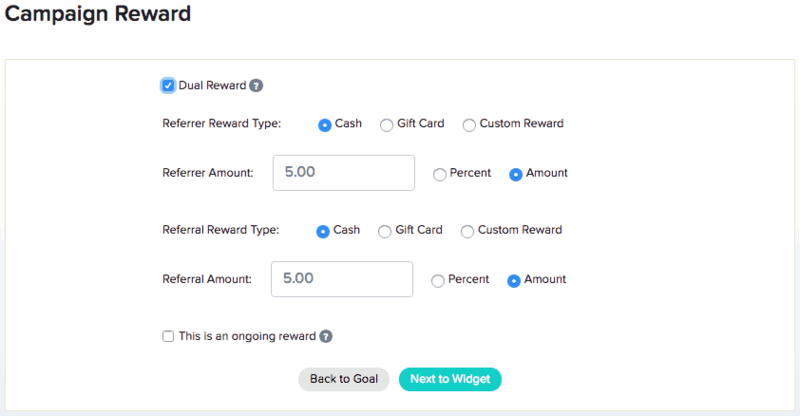 Inside your SalesCamp dashboard we’ve made creating a dual sided reward super simple. Here’s a screenshot from one of our campaigns where we’re set to give the same amount to both Referrer and Referral, but of course you’re welcome to customize this to fit your business objectives and customer needs. We’d love to hear how your new Dual Sided Rewards are performing. And in fact we’re collecting a few Case Studies to show the performance difference between Single and Dual Sided rewards. If you’re interested in sharing your experiences please drop a comment below this post, or send us an email at hello@salescamp.io and tell us all about it. We’ll be compiling these experiences into an upcoming blog post and white paper on referral program performance. Previous Post: « Referrer Dashboards Are Here!